For Dungeon Scene move Creature stand and microscope desk to rear and set up a cardboard stone wall behind cages. Contact Jeannette Jaquish for set suggestions. From left to right is the lever on the wall that Dr. F pulls in the last scene, the scientific equipment that Winston tries tearing apart, Eyegore's spray bottle, the window Old Lady or Man Wellard pops through last scene, the creature covered up with a cloth, the rug Eyegore pulls out from under Winston, the bucket Eyegore swings in the first scene and that Misty kicks in the last scene, the two operating "tables" that Ned and Alexis are strapped to last scene and the electrocution helmets they wear hanging between the tables, the operating tools table, above that is Misty's chain that she wears and unhooks from the wall in the last scene, her bowl of water that she spills, the dissection table that the Dr. tries to strap Alexis onto in the first scene, Eyegore's broom he cleans with, and whacks Misty with, the shovel Petunia tries to conk the Dr. with, the Dr's stethoscope - not used, coatrack with Eyegore's purses, clotheslines with rubber gloves and Eyegore's underwear, the door, the bloody bucket, the Dr.'s table with the microscope and the basket of Eyegore's sewing kit. So nearly everything gets used. 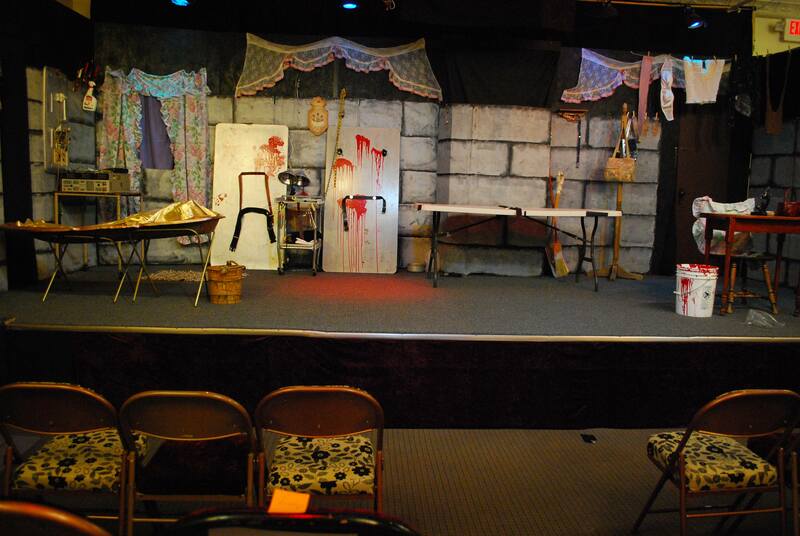 We closed the curtain and set the dissection table on the edge of the stage and set up cardboard scenery covered with cloth "grave" on the floor in the audience pushed against the stage. The grave actors stood on the floor center, and Old Lady Wellard stood on the table looking down into the grave. There was a ladder as part of the grave scenery that the kids climbed up then stepped over the top edge of the scenery onto the table. Tricky.